Italian physician, and writer on medicine and astrology; born at Oria, in 913; died after 982. When twelve years of age he was made prisoner by the Arabs under the leadership of the Fatimite Abu Ahmad Ja'far ibn 'Ubaid; but was ransomed by his relatives at Otranto, while the rest of his family was carried to Palermo and North Africa. He turned to medicine and astrology for a livelihood, studying the sciences of "the Greeks, Arabs, Babylonians, and Indians." As no Jews busied themselves with these subjects, he traveled in Italy in search of learned non-Jews. His especial teacher was an Arab from Bagdad. According to the biography of Nilus, abbot of Rossano, he practised medicine for some time in that city. The alleged gravestoneof Donnolo, found by Firkovich in the Crimea, is evidently spurious. 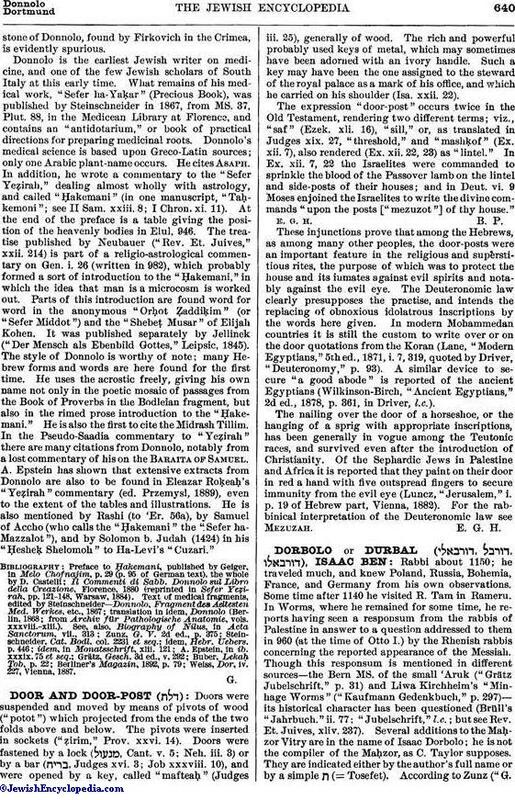 Donnolo is the earliest Jewish writer on medicine, and one of the few Jewish scholars of South Italy at this early time. What remains of his medical work," Sefer ha-Yaḳar" (Precious Book), was published by Steinschneider in 1867, from MS. 37, Plut. 88, in the Medicean Library at Florence, and contains an "antidotarium," or book of practical directions for preparing medicinal roots. Donnolo's medical science is based upon Greco-Latin sources; only one Arabic plant-name occurs. He cites Asaph. In addition, he wrote a commentary to the "Sefer Yeẓirah," dealing almost wholly with astrology, and called "Ḥakemani" (in one manuscript, "Taḥkemoni"; see II Sam. xxiii. 8; I Chron. xi. 11). At the end of the preface is a table giving the position of the heavenly bodies in Elul. 946. The treatise published by Neubauer ("Rev. Et. Juives," xxii. 214) is part of a religio-astrological commentary on Gen. i. 26 (written in 982), which probably formed a sort of introduction to the "Ḥakemani," in which the idea that man is a microcosm is worked out. Parts of this introduction are found word for word in the anonymous "Orḥot Ẓaddiḳim" (or "Sefer Middot") and the "Shebeṭ Musar" of Elijah Kohen. It was published separately by Jellinek ("Der Mensch als Ebenbild Gottes," Leipsic, 1845). The style of Donnolo is worthy of note; many Hebrew forms and words are here found for the first time. He uses the acrostic freely, giving his own name not only in the poetic mosaic of passages from the Book of Proverbs in the Bodleian fragment, but also in the rimed prose introduction to the "Ḥakemani." He is also the first to cite the Midrash Tillim. In the Pseudo-Saadia commentary to "Yeẓirah" there are many citations from Donnolo, notably from a lost commentary of his on the Baraita of Samuel. A. Epstein has shown that extensive extracts from Donnolo are also to be found in Eleazar Roḳeaḥ's "Yeẓirah" commentary (ed. Przemysl, 1889), even to the extent of the tables and illustrations. He is also mentioned by Rashi (to 'Er. 56a), by Samuel of Accho (who calls the "Ḥakemani" the "Sefer ha-Mazzalot"), and by Solomon b. Judah (1424) in his "Ḥesheḳ Sheiomoh" to Ha-Levi's" "Cuzari." Il Commenti di Sabb. 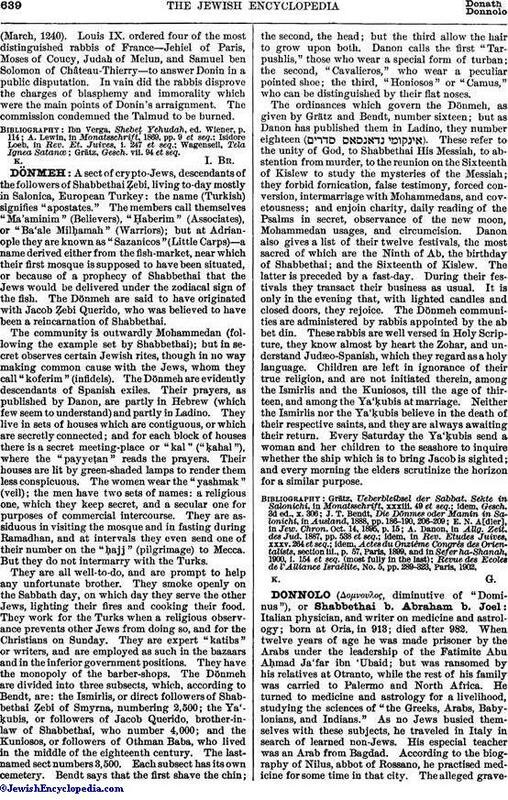 Donnolo sul Libro della Creazione, Florence, 1880 (reprinted in Sefer Yeẓirah, pp. 121-148, Warsaw, 1884). from Archiv für Pathologische Anatomic, vols. xxxviii.-xlii.). Weiss, Dor, iv. 227 Vienna, 1887.